Acclaimed at the Soviet Peace Fund Conference in Moscow and published in Russia by Moscow's Library of Foreign Literature and Magistr Publications. The Liberian BioCognetic Education program about understanding the cause and effect of conditioned thinking that was successfully taught to the children of war in the Liberian Project was based on Dr. Terrence Webster-Doyle's book and curricula Why Is Everybody Always Picking On Us? Understanding the Roots of Prejudice. "There have been many theories put forward as causes of the Liberian civil war — including unemployment, abuse of human rights, political patronage, illiteracy, lack of development and tribalism, among others. While it is true that all of these factors may have contributed, at the heart of the Liberian conflict — as with all global conflicts — is psychological conditioning, the fundamental cause of human conflict." - From Brave New ChildOut of one of the most violent civil wars in recent history comes the inspiring and courageous story about twenty children of war and their dedicated teacher at their peace school in Buchanan, Liberia. These children were raised in war; they know nothing else. Their teacher, Marvin Davis, having had to flee Liberia because his life was in danger came back to teach the children of this war torn country about what caused the war they just had gone through. Putting his own life on the line, and with his father having died in the war, he decided that he had to help these young people to understand and resolve conflict nonviolently lest there be another and perhaps worst civil war out of the ashes of the recent one. Searching the Internet for peace educating organizations that would help him he found the Atrium Society USA. Out of this search he began a friendship with the distinguished child peace educators Terrence and Jean Webster-Doyle and through their Youth Peace Literacy Program received the training and materials in their internationally acclaimed, award winning peace educating programs to do what he wanted in Liberia. Working together as a team the three of them helped establish the Common Ground Society Peace School of Liberia. It was at this point they decided that Marvin should teach the children the Atrium curricula Why Is Everybody Always Picking On Us – Understanding the Roots of Prejudice to see if this program could have any effect on the conditioned views of these children who knew nothing but war. When you read these 20 Lessons Marvin Davis has sent back to the Webster-Doyles in the form of letters you will see what can happen if young people are taught to understand conditioned, prejudicial thinking that has time and time again lead us into war. These Lessons demonstrate that no matter how conditioned one is to violent behavior, and these children of Liberia are perhaps the most severe cases one can imagine, that they can be liberated from that habitual mindset. And if they can, so can all children who face conflict daily – from bullying on the playground to bullying on the battlefield. 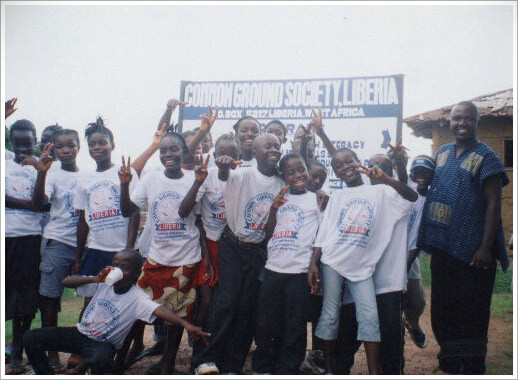 Marvin Davis with the original students from the Common Ground Society's peace education after-school program in Buchanan, Liberia. We asked Marvin Davis of the Common Ground Society Peace school to let us know what some of the children had learned now that they had attended the after school program. Considering that these children grew up in war, that that was all they knew about how people related to each other, the following comments are a very promising sign that even these young people raised in war can go beyond that conditioned mindset with the right education. Whereas before all they knew was one way of relating to each other now they have been shown that there is another way, one that does not lead to conflict but to peace. Marvin Davis: I held an interview with four of our students who recently finished the Peace School. The interview was about the hope for Liberia, what they envisaged the country to be in the coming years and will there be lasting peace, or do they see another war in the making? The basis for the interview was to see how the curriculum on prejudice affected their outlook now. Shad: “Others may want to fight but for me I will never fight. What is the use for fighting? 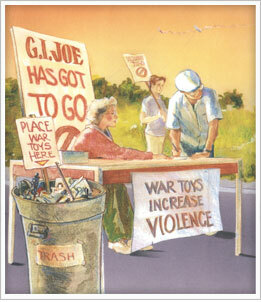 I am a different person now and I hope many children will understand that fighting a war is wrong. We should settle our problems without fighting. The way things are now, it is going to be hard to fight again. Everybody is doing something now because peace is here." Briefly what was discovered, that could provide a completely new paradigm for peace education, is that even though the Liberian 15-year civil war seemed on the surface to be caused by decades of antagonistic ethnocentric, tribalism was instead at the root, caused by a far deeper compulsion. After carrying out a test case of twenty former child combatants' post-war behavior for five years in Buchanan, just after the war's end, the book Brave New Child - Liberating the Children of Liberia and the World, shows us that the fundamental cause of the war was due to a neurological instinctual malfunction in the brains of these young warriors. The Atrium research studies have put forward the notion that these young combatants' brains had been thoroughly programmed to fight people they were told were their enemies because of years of political and economic propaganda, but in reality there was a far deeper biological primitive impulse already inbuilt into their brains, as it is with all participants driven to war. This drive has been rooted for eons in the primeval human brain being hardwired for war as a genetically programmed survival instinct - but it was maladaptive and was therefore paradoxically preventing survival - and that was the cause of the conflict. What this evidence continues to demonstrate, according the Atrium Youth Peace Literacy programs that were used, is that the Liberian war's cause is analogous to a mechanical defect in our computer-programmed brains - in essence, a short circuit, which keeps on creating conflict without being aware that it's doing it. Since we are ignorant of this malfunction in the primitive old brain that causes conflict because it is trying to survive in this mistaken way, war is no one's fault. No one is to blame. There's no reason for revenge. It's just a biological error in the old brain that we are unaware of. It is a disturbing dysfunctional error in how we keep struggling towards, and yet preventing, our own survival. Even though we are not to blame, we are responsible to understand the implications of this and to educate our children as to the consequences of what this could mean, individually and socially.